This case study describes Crossrail’s approach to resourcing the client and supply chain teams for quality. Early on there were concerns that, in terms of quality, the construction industry is playing catch-up in relation to other industries. Recognising that many sectors are reaping huge benefits from the implementation of formalised quality management programmes, including increased efficiency, productivity and staff morale, Crossrail developed the Quality Professional training programme in partnership with the Chartered Quality Institute (CQI) and it was mandated that all quality resources on the programme participate. The format of the programme is that nine modules are covered over 14 days rand it requires a formal examination to be undertaken. Once delegates successfully complete the training programme providing they have the minimum experience requirements (5 years working with Quality) they are able to apply to the CQI for formal chartered membership and become MCQI CQP. This case study is applicable to other major construction projects developing their quality management strategies. It is also relevant to main contractors and SMEs in providing good insight into what clients may require on future major projects. Crossrail believes quality is the common denominator in working safely and getting things right, to the right standard, right first time and affordably. Hence quality on the Crossrail programme, alongside health, safety and environment, was seen to be of critical importance to the success of the programme. A robust Quality Model was developed and Crossrail were keen to ensure that the client team and the supply chain had people with the right skills to successfully implement it . Stringent competence requirements for quality managers were incorporated into the Supply Chain Contract Works Information, which included membership of the Chartered Quality Institute (CQI) or equivalent. However it soon became apparent that the industry as a whole was struggling to meet these requirements and that a skills gap existed. Crossrail partnered with the CQI to develop a training programme to address the capability gap. A training package was developed, customised from The Certificate of Training in Quality Management Practices. This resulted in a bespoke training course consisting of a series of nine modules over a total of 15 days specific to the construction industry. This was offered to the Crossrail quality team and the supply chain. Five training courses were run with 76 people successfully passing the programme. Successful attendees were then also eligible to apply for MCQI status. Successful completion of the programme was based on attendance and passing the examination/assignment requirements for each module. Delegates who had successfully completed all modules were eligible to apply for the Chartered Member grade and those who completed three units of the programme could apply for the practitioner grade. Crossrail delegates used their training certificate in support of their application to membership. Other companies, such as , Costain and Laing O’Rourke have developed their own Quality Management Programmes (QMP), based on the Crossrail model, but tailored to their organisations. The learning benefits obtained from this course have provided Crossrail (and the industry) with a cohort of quality managers across the client team and the supply chain who meet the competency requirements, who operate from a common understanding of the quality process and can apply the knowledge learned from the course to enable them to manage quality more effectively on a day-to-day basis. A key lesson learned for future projects to consider is to review and address where possible capability requirements for major projects in advance of commencement. Addressing, from the outset, the specific quality issues and needs to be met are vital. A key second point is that the supply chain and construction industry need to adopt ongoing quality capability development to ensure an ongoing supply of qualified quality professionals. This Learning Legacy paper sets out the training framework, which may be of use to future projects and programmes in the construction industry seeking to improve their quality resource capability. The course was broken down into 9 modules as detailed below. Delegates benefitted from attending this course because it firstly challenged them to define what exactly quality is and asks them to develop their own personal definition. They are introduced to the concepts of a management system and why organisations use a management system. The course defined the role of the quality professional, the use of standards and the responsibilities of the quality infrastructure. It also included a session on organisational culture and how to ensure that it is fit for purpose. In short, the course introduced delegates to those topics that are usually taken for granted but not always fully understood by entrants to the profession. One of the key responsibilities of the quality professional is to support process owners to design, develop and deploy their business processes. This course equipped quality professionals with the coaching skills to not only support process owners design their processes but also to improve them and identify process risk and manage risk at the appropriate stages of their process. The course emphasised a number of key messages when undertaking this task. For example, to never muddle process with instruction, to never design processes for process owners, but to coach them to design their own processes, to start simple and to start with very few process measures. This course also developed and helped to develop the skill of coaching: a fundamentally important skill. Knowledge and skills of auditing are important for a quality professional for many reasons. Primarily, it is a process by which the quality professional can assess the suitability, adequacy and effectiveness of the organisation system, processes and procedures against a set criteria, for example, the requirements of ISO 9001, other standards, customer and stakeholder requirements, and an organisation’s own policies. This can act as a gap assessment through which the quality professional can decide the degree of conformance to the requirements and identify the risks and opportunities and the relevant actions required for conformance and improvement. Therefore it is also a process for continually assessing and improving the performance of the designed system, processes and procedures. Furthermore, the knowledge and skills of auditing allows the Quality Professional (QP) to also focus on how its organisation can ‘demonstrate’ conformance to second and third parties, should the demonstration of conformance be required. From this course, the delegates learned why auditing is important, why audit, what and when to audit, how to report the results both verbally and in writing; and how to action the results. The course included a case study and role-plays to simulate a live audit process as much as possible, and is highly interactive. The case study was tailored for Crossrail based on the type of processes and type of findings their QPs and their contractors’ QPs may come across in an audit. Another of the key responsibilities of the quality professional is to support problem-solving teams in getting back to root cause and then arriving at the optimum solution. The approach to getting back to root cause is based on standard methodology ensuring that the problem has been robustly defined before embarking on a detailed investigation. The approach to developing the solution is comprehensive and ensures that solutions are developed to correct the problem, prevent it from reoccurring and to share the lessons learnt during the process of investigation. Techniques to consider risk when developing the solution are also included, for example risk-based decision-making is used to determine the risks associated with the cheapest solution to ensure that when these risks are managed the associated costs do not mean it is no longer the cheapest. This course contained a number of the well-known quality tools such as the cause and effect diagram, the Pareto analysis, the 5 ‘whys’, histogram, failure mode and effects analysis, task analysis and the Kepner Tregoe technique for defining the problem and setting objectives for the solution. Fundamental to achieving project, product or service quality is an effective and robust quality planning process. This course ensured delegates understood that quality planning is a lifecycle activity starting at the inception of an opportunity and continuing throughout the full lifecycle. Most importantly it made sure that delegates understood the importance of identifying quality risks at every stage of the lifecycle, evaluating these risks to identify severe risks and allocating prevention resources to these risks. Although this course focused on the planning process it also covered the creation of contract quality plans and detailed controlled plans such as inspection and test plans. 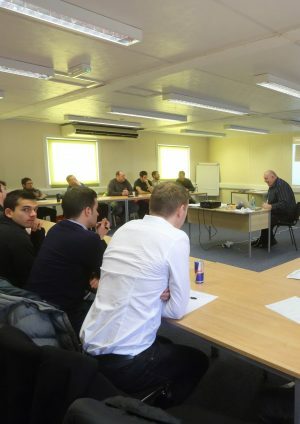 This course introduced the delegates to the importance of communication and managing relationships in the supply chain. Both of which are important skills for a successful QP. The delegates are introduced to a proactive approach for the above and methodologies for evaluating customer satisfaction and evaluating suppliers’ capability and performance; and how to ensure their organisation works in partnership with each side of supply chain towards the same goals. Delegates benefit from attending this course because it introduces them to the subject of costing quality activities and calculating the cost of bad quality, delays and rework. Also discussed were the definitions and several concepts of the cost of quality. Delegates were introduced to the detail of both the Iceberg and the Performance Assurance Framework (PAF) models of cost of quality. They also began to understand why and how organisations could use these models to their advantage. The course describes how to explain to management what the cost of quality can bring to the organisation and the day completed with discussing benefits for individuals, departments and the organisation by discussing how to improve based on newly gained evidence and knowledge. Delegates are introduced to some of the tools not included in the problem solving and decision making course, for example, classical brainstorming, the affinity diagram, Delphi and paired comparison voting techniques and the interrelationship diagram. Crossrail were keen that the quality professionals that participated on this suite of training should have a basic understanding of statistical process control, so included were sessions on process variation, variable and attribute data, characteristics critical to quality, and the average and range chart and a chart for attribute data the P chart. The top management commitment to quality and supporting the quality professionals is an essential factor for “quality” to work in an organisation. The skills of the QP (effectively communicating the reasons for “quality”, the benefits, and the required resources as well as the return on investment) is an important factor to get top management commitment and support. This course helped delegates to learn how to make a case for the importance of “quality”, how to communicate that to top management in an effective manner (and through risk identification, risk assessment, analysis of performance data, etc) in order to get the support needed to implement it. Furthermore, the course included the techniques for also communicating with and influencing the people within the organisation where challenges are provided by this group. The course included role-plays and presentations where challenging situations that QPs may face are simulated and skills are developed and improved. Morgan Sindall has a strong focus on Quality, with an underpinning philosophy on perfect delivery, which seeks continuous improvement. Lawrence Ryan, MCQI CQP, Quality Manager at Morgan Sindall found the course was well structured, delivered by competent trainers who had vast knowledge and experience which was fully shared for the benefit of those studying. “The course confirmed to me everything that I thought Quality Management should be and enabled me to put practices in place to improve Quality Management on the project. It also allowed me to discuss ideas with other Quality Professionals that I would not have otherwise met,” said Ryan. Ryan said the course has given him the industry qualification that many of his key clients are asking for as part of their contract requirements, allowing them to have a wider number of people to nominate for future works. A key piece in the jigsaw of supply chain Quality Management. Morgan Sindall have recognised the importance of this qualification and have subsequently placed two more people on the course. “We now have three more people with MCQI status than we did three years ago. The knock on effect of this has been an increase in what Quality is within the senior management team and much greater support for what we strive to do as Quality Managers,” added Ryan. Paul “Pavlos” Inglesis , CEng MICE, MCQI-CQP, RfL Stations Sector Quality Engineer completed the Third CRL/CQI Course in November 2014. He recommended its in-depth nature. The successful completion of the course also offered Inglesis the opportunity to apply for, and achieve, the MCQI-CQP level, which is now becoming a requirement for every quality professional in the construction industry. The construction industry has been a traditionally resistant environment to engage with new methodologies and practices. But root cause analysis, auditing, process development and statistical methodologies can help the construction industry move forward to being more productive, efficient and lean. Some participants found other benefits. Chris Glass, MCQI CQP, Quality Engineer at Systemwide, noted that Quality can sometimes be a bit abstract, but this course changed his opinion. Quality Manager at Costain, said the course helped on three levels: it helped him in his personal development, it helped the company with a better performance and process and the industry with better Quality overall. Kerli Saarnik, MCQI CQP, Quality Manager at Bam/Ferrovial/Kier JV – Crossrail, set out the benefits for herself in a checklist style that she had ticked off throughout: she developed real personal expertise, improved her career prospects substantially; demonstrated her competence to a high level; achieved great networking and more training opportunities and the recognition as a Quality Professional and chartership. It also highlighted strongly that BFK is taking Quality seriously, another example of the industry talking Quality forward. Judith Griffiths is Lead Certification Manager at Crossrail. In her current role she oversees the certification and completion processes across projects; covering stations, tunnels, portals and shafts, depots and systems. Her day-to-day role mainly consists of liaising with the project teams on certification/completion matters to ensure they meet the requirements of the contract. “none of them were aimed at the construction industry and most of them were theoretically based”. As an existing ACQI member of the CQI Griffiths also wanted to use this as a method of obtaining her MCQI status. She added that she used this course to refresh her previous understanding and learn some new techniques and information. The modules Griffiths found most useful were process design and root cause analysis. “Amending some of the instructions and guidance and providing further training has made a difference to the process and the output results have climbed significantly.